L.A. the Blog: Papaya King L.A. While L.A. the Blog is a little late on the scene reporting that Papaya King is opening in Los Angeles, well it is and it will be here this Spring (L.A. Weekly reports in April). It is located just off Hollywood Boulevard’s main club drag on Wilcox Avenue. The question remains how late it will be open, but 24-hours a day sounds good. Not to be confused the Papaya Dog, nor Gray’s Papaya, but yes it is the original chain that opened back 1932. For a little rumor history, people say that Papaya Dog was started by a former employee of the original Papaya King, and it might be said about Gray’s Papaya too. All I know is that if the hot dogs have that New York City snap, they will be something unique in Los Angeles. 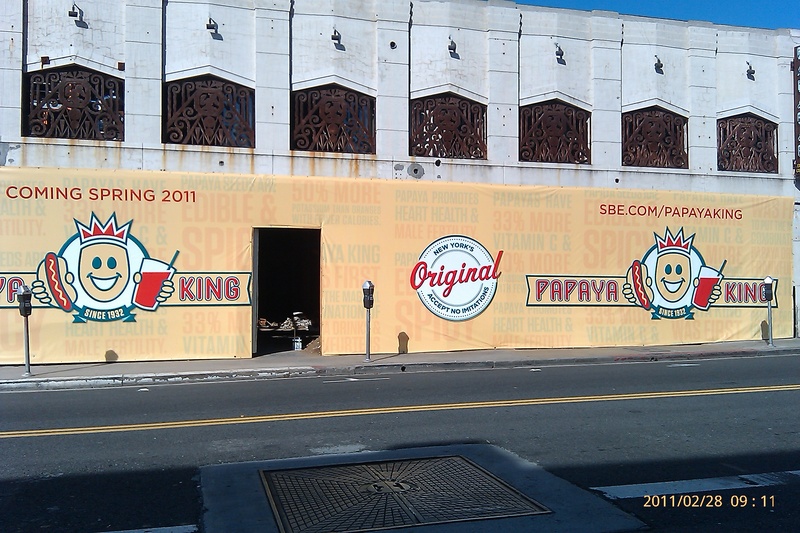 UPDATE 4/19/13: Papaya King didn’t last long in Los Angeles, most likely from the crappy service, and is now closed. This entry was posted in Food, Hollywood, L.A., LA, Los Angeles, LosAngeles, New York City and tagged Food, Hollywood, Los Angeles, New York City, Papaya King. Bookmark the permalink. ← L.A. the Blog: What’s up with graffiti in Hollywood?